Can Target Corporation (TGT) Withstand Amazon.com, Inc. (AMZN)’s Wrath? 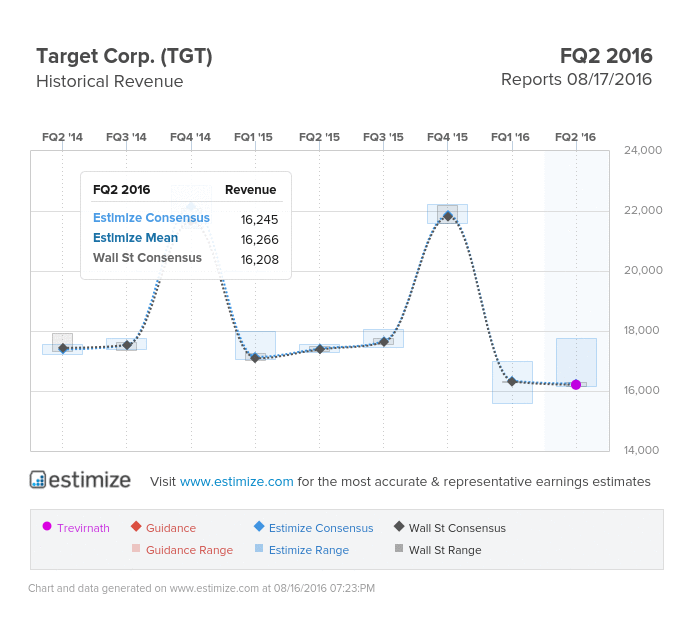 Can Target Corporation (NYSE:TGT) Withstand Amazon.com, Inc. (NASDAQ:AMZN)’s Wrath? What are you expecting for TGT? Get your estimate in here! Target is scheduled to release its second quarter results early Wednesday morning. The company is the second largest discount retailer only to Walmart. But Walmart isn’t a direct competitor to Target, rather it’s the increasingly popular online retailers like Amazon. Growing trends towards online retail is partially to blame for consecutive misses on the top line. This isn’t a new trend though. Over the past 8 quarters, sales growth has progressively decelerated to its current position in negative territory. Based on the Estimize consensus data, this doesn’t appear to be the quarter Target will bounce back. Analysts are calling for earnings per share of $1.14, 6% lowers than the same period last year. That estimate has climbed 1% since Target’s first quarter report in May. Revenue is anticipated to decline by 7% to $16.25 billion, consistent with the recent slowdown. Shares are up almost 5% year to date but down 4% in the past 12 months. Investors shouldn’t expect this to move much as a result of Wednesday’s report. Target has undertaken a series of initiatives to reignite growth. Many of them surround promotional campaigns and development of its omni channel capabilities. Online sales should continue to deliver doubt digit growth and somewhat offsetting weak in store sales. Efforts to pick up brick and mortar sales include optimizing inventory levels, streamlining pickup in store and ship to home ordering options. Progress in these areas would be a huge win considering expectations have been generally low. The company also plans to expand its merchandising assortment. They have been seeing considerable strength in Style, Baby, Kids and Wellness categories. As Target continues to emphasize these segment, sales should continue to rise. Target did sell its pharmacy business to CVS late last year in an effort to focus on higher profit lines. This strategy might impact total revenue in the near term but expectations are that it will payoff down the road. 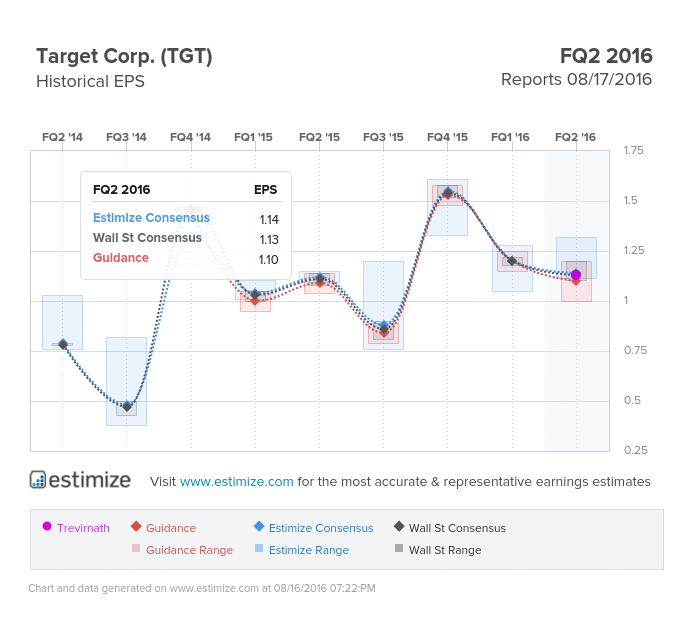 Stiff competition and a weak spending environment will likely be mentioned if Target posts another top line miss. Do you think TGT can beat estimates? There is still time to get your estimate in here!